With 4 simple ingredients and 3 easy steps, whip up this delicious chocolate mousse perfect for the end of every dinner. Melt the chocolate in a bain marie or in the microwave. Put the condensed milk, cream and melted chocolate in a bowl and whisk using an electric whisk the mixture to soft peaks. Pour or pipe into 12 small bowls and chill for 2-3 hours. Serve with fresh berries. Get creative with your flavours, perhaps add some orange zest or top with chopped toasted nuts or for a mocha version add a shot of espresso to the cream. 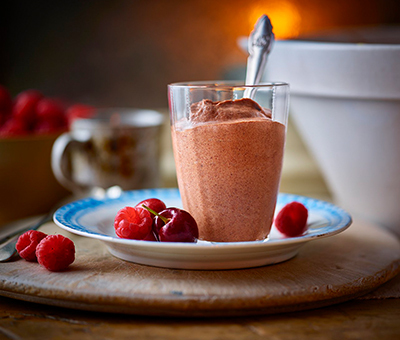 This makes the most amazing no-churn chocolate ice cream – simply spoon the finished mousse into a clean plastic food container, seal with the lid and freeze until solid! Leave out at room temperature for 10 minutes before scooping into cones.